I am not trying to start a debate (sigh it might happen) and I know both packages are powerful and very useful. With the sale on Filter Forge at 70% off its tempting me. I would want the pro version for the normal maps. The thing about Genetica I like from reading/ watching the tutorials is creation of seamless textures, while filter forge has 1000's of premade ones. I think I read that Photoshop will take and make seamless (though I haven't looked for a tutorial). For those who use both, which do you use most and what do you do in the one where you have to switch to other one. 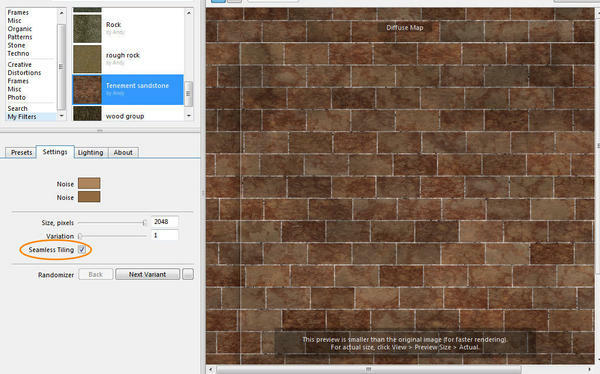 Filter-forge has a "Seamless tiling" option, (see pic) which is available on all on all surface (3D texture) filter's you create. so I think you've picked that info up wrongly,.. The demo version of Filter-forge 4,. has all the features and options enabled,. you should play with the demo's of both programs to see which you prefer. I'm extremely bias. Just for the info, Genetica has premade texture build packs on site, as well as what comes with it. All free. Now the question is can filter forge make HDRI's? Can it make textures way beyond seamless? I've made quite a few character skins with it. Can filterforge be used for photo editing? Can filterforge do animated textures? Can it make sky boxes and sky domes? I purchased Genetica a while ago, and it is powerful, but found compared to Filter Forge it can need many more nodes to get similar results. So I purchased Filter Forge and now use that. I must be getting slow, 2 replies as I was typing lol. I bought Filter Forge a very long time ago, and I think I used it once. Personally, I'd recommend getting a camera instead. You'll get much nicer textures, IMO, by using photographs of real stuff. And it's more fun, too. But that's the wrong type of advice for this forum, so I'll shut up now. Sorry for butting in. With Filter Forge giving the ability to create textures/seamless and normal maps/ambient occlusion maps etc, then that is what is wanted from a texture maker. For current $119 US for those functions in Filter Forge compared to Genetica at $899 to get similar functions, difficult choice?. can filter forge make HDRI’s? You can also create colours,. and set those colours to HDRI so you could make a simple gradient and all the colours in that gradient will use floating point values. Can it make textures way beyond seamless? That's got me confused,...I've no idea what is meant by "beyond seamless". ? if it's seamless, it has no visible seams. Can filterforge be used for photo editing? You can use alpha Masks in filter-forge so that you limit textures to a specific area, (like a skin texture) ,.. yes. Can filterforge do animated textures? Again, it's built into photoshop, which can be used to create a range of frames. Can it make sky boxes and sky domes? I've never tried it, but I'm sure it's possible,. but if you can make an HDRI, .....why make a sky-box or dome. Does Genetica allow the user to create Photo-filters and texture maps, or just texture maps ? Does Genetica allow the user to create a single "texture" with multiple saved "Presets" options . Do you still think these 2 are comparable? Since both programs do similar tasks,. Yes,. I think they're comparable. I have done that and still do now and again, but it can be very time consuming getting other maps (such as normal maps) from a photo (well, maps that work well). I think this is generally good advice to anyone wanting to make textures. Personally, I’d recommend getting a camera instead. You’ll get much nicer textures, IMO, by using photographs of real stuff. Unfortunately it's a bit out of date,. since Filter-forge can use images as the sources for gradients, mixers,. fractal noise, bricks and just about any other filter,... and it can also use HDR images. Out of date?? Does Filter Forge include a camera?? Andy, once again I'll just say "Andy, you're right", and let it go at that, since that's what you really want to hear. Beyond seemless is in reference to doing far more then just seemless textures. skyboxes and domes are for games. That looks interesting, thanks for the link. Not sure if I would use it enough to pay that much for it though. Just a question. What texture/normal maps would you be making? Just thought it worth mentioning. Unless you need 6000x6000 textures and animation presets then the price is $399 for genetica pro. And it generally goes on sale before a major upgrade by the way. It is my preferred choice for creating textures. There are quite a few presets but if your going to use presets that everyone else uses then I would just save time and buy created resources. Wow there are so many wonderful responses. Thank you 3dAge, Stan for all the information. Good point Khory (though still out of my price range at that price). cdordoni Interesting looking software. Joe that should stay in the arsenal always too, always can use a camera to feed into the pipeline. Steve I think that is why my indecision, I don[t have a clear picture of what I am going to be doing still. The price is whats got me drawn in 119 is a bargain, and at that I am not sure I will 'use' it. Thats an idea about the extra plug-ins. I was attempting a tutorial on Hex from GeekAtPlay the 'hut' one used a filter forge texture for the palm material. In the light of not knowing perhaps I should wait till I am against the wall and I NEED to make a texture. I have various ideas from Space Vehicle / Planet scenes to a Mid-evil world (not human though) to military uniforms for some specific ideas/renders. I apologize if this started some debate. It sounds like I couldn't go wrong with Filter Forge at the price. I did watch some of the creation of textures in Genetica (The one making the boards with the Nails attached, was very cool). I am going through some tutorials on Filter Forge trying to get a handle on how it works, and it seems it would be similar at least for the board creation. I am not sure about the nail placement). Character skins you say? I would love to know more about that. I use Genetica as well but I'm not good enough to make human skin. I have several images I use which I then layer afterward. I've got leather, pores, these types of images which I derived seamlessly from Genetica, but I can never compile it so that it comes out looking like finished skin. Any insight you can provide me in a pm or personal email would be greatly appreciated. Thanks in advance. Keep in mind that seamless, procedural textures of the kind that are generated by software are just that....seamless, but procedural. Which means they are repeating patterns. And they are generally perfect, repeating patterns. However, in the real world, almost nothing is a perfect, repeating pattern. Brick walls aren't, wood grains aren't, leather isn't, and on and on. And your brain subconsciously realizes that. In the real world, you generally don't have to worry about "seamless textures". You can take a camera with a tripod, and take as many photos as you want of a particular texture, and stitch them together when necessary. No need to worry about making stuff seamless, and no need to worry about people recognizing the pattern is repeating. And most importantly, you are capturing all of the subtlety and variation that exists in real life patterns. Stuff like the subtle variations in brick and grout colors, the wide variation in wood grain and stain colors, the wide variation in metal finish and rusting patterns, the wide variation in weathered exterior walls due to dirt and paint deterioration and peeling, etc. None of that stuff is procedural, and none of it is perfectly repeating. But it all gives life to the texture, and places the viewer in the scene. Yeah, you can throw some random noise in there, but that doesn't reflect the purposeful variations that are introduced into real textures. You can have the most perfectly seamless procedural image with the most accurate displacement and bump and normal maps, but your texture won't even come close to the incredible variation and interest you get in a real life texture. And another huge benefit of not relying a software-generated textures is that you actually get up out of your chair and go out into the real world and see and touch REAL textures. You study them, and start to realize what the bump/displacement map should REALLY look like, and how the leaf has translucency and subsurface scattering and a certain texture to the touch. And you come away with a much better understanding of the textures, and as a result your surfaces will look 10 times better than if you let some software do the work. And of course you can save yourself a lot of money, and have a lot of fun in the process. Yeah, I know that everyone likes to play with software, and just about everyone will say using a camera is a good idea, but never actually use one for textures :) . (Okay, that's an exaggeration, but I'm sure it's not far off....). And everyone will list all of the stuff you can do with software, and yeah, if you really need that stuff it might be useful. But, IMO, most of that stuff you really don't need. Anyway, for those who really want to develop your skills in texturing, just consider taking a more hands-on approach, and not let the software do it for you. I guarantee you can spend just a few hours with a camera wandering around inside and outside and build a whole library of great textures. And they'll probably blow the shorts off anything you can generate with software. Templates ;) I took a UVmap and turned it in to a skin template. Using another copy of the UVmap I used a paint program; photofilter, and painted in muscles to make a muscle "noise". Then it is just a matter of keeping the edges seemsless. I will recommend when doing tattoos to keep them off the body part seems. But you may still have to do some seem matching in a photo editor. The problem with using photographs vs created textures is the lack of control over things that should not be in the texture. Things like shadows, glossy spots, reflection, and dirt that does not match for example. There is also the issue of scale and getting a photograph that will correctly scale something like a brick wall all in one photo. Sometimes the photo can be cleaned up and sometimes it is nearly impossible to rid of all the extraneous stuff. The reason you get so much unrealistic repeating in some textures with templates is due to people not creating an initial texture that is large enough to cover the full area on a template at the proper scale. And not having enough layers so that there is variety in coloring etc. Even with textures that are meant to tile it isn't impossible to create textures that won't show any repeat pattern in use. Of course that is constrained by area to be covered and what size textures your willing to use. Not to say that photographs are not a great starter for synthesizing textures. I use them regularly to get a base layer and occasional to do most of the final texture. This, it appears is one of the big areas that most people don't even realize is possible in procedural shaders, and is one of the areas of great potential in creating good procedural shaders. Feeding multiple good textures into the shader tree, having good noise variation layers with offsets, etc... all contribute to making a sophisticated and high quality procedural that most people wouldn't realize is a procedural. Another trick is to ajust seems in a 3D paint program, like the 3D feature of Photoshop Advanced. Carrara has 3dpaint. You can actually make a seemless texture and paint it on the figure. Let me put a big "supposedly" in there. I usually have no problem with 3dpaint in carrara. It's a nice tool for quite a few things, painting figures is not one of them. Or at least DAZ figures. Every time I try I get painting on areas I'm not painting, like working on an arm and having the painting come up on the head. This would be great for fixing bad seems, if it worked. The 3D paint in Photoshop works great but might be cost prohibitive for some. Blender has great 3D paint tools supposedly but I haven't tested them yet myself. I will, as it appears outside of DS it will eventually be my goto tool. The problem with using photographs vs created textures is the lack of control over things that should not be in the texture. Things like shadows, glossy spots, reflection, and dirt that does not match for example. Of course. You can't just take a camera outside whenever you feel like it and take a photo of the first thing you see. You may have to do a bit of planning first. If you're concerned about errant shadows, you wait for a time when it's a bit overcast and there's a lot of ambient light and few direct shadows. The kind of stuff most photographers consider when they are taking photos. IMO, it's not nearly as challenging as you suggest. No, it's not as easy as dragging and dropping some textures somebody else made, or pressing a few software buttons and have some procedurals generated automatically, but it's certainly not real difficult. And when you say "lack of control", I strongly disagree. In fact it gives you total control, versus having something generated automatically based on somebody's software algorithms. You can choose which brick wall to photograph, what lighting & time of day, etc. No, you're probably not gonna find exactly what you want in the first 20 minutes, so you build up a library over a period of time. You go somewhere, take your camera. Not only for textures, but for reference photos and for learning. And since the alternative is likely to be results that look not nearly as good, those who really care about the quality of their textures might want to put in the slight extra effort. And again, a huge part of the effort is actually SEEING and TOUCHING the textures in real life, as opposed to generating something that corresponds to a misty memory of the last time you saw something. Which generally, IMO, is never nearly as accurate as you believe it is. I'm always amazed at how so many people here have such an aversion to doing anything that isn't a drag 'n drop/software solution. And I'm not addressing that to anyone in particular, just a general reference. And there's no need for anyone to take offense, especially if it doesn't apply to you. Oh, and BTW, for those who feel that picking up a camera is too much trouble, there are a number of free texture sites online where you can get photos for textures. One of the most popular is cgtextures.com. Still a bit limited, but still there are quite a few nice photos for all different types of textures. ..If you're concerned about errant shadows, you wait for a time when it's a bit overcast and there's a lot of ambient light and few direct shadows.. This is good advice for people looking to take pictures for textures who don't have a photographic background, so good on you for mentioning it. However, you then slide back into an overly simplistic concept of the use of procedurals. Your complaint of them centers around a very limited and not very sophisticated use of procedurals. Take a look at some of the filter forge filters... take a look at any that go beyond repeating a basic pattern over and over. This is what Khory was trying to point out and I tried to expand upon. if you keep going back to kindergarden use of them and complaining, of course the complaint will seem valid against that level of use. No one will take you seriously if they have a decent understanding of the possibilities beyond that though. I will reiterate what Khory tried saying and I also said in a previous post. Using procedurals does not preclude using better texture maps, it builds on that base and uses techniques to expand what one can reasonably get with just texture maps without going to texture maps that are much larger then they need to be. There are valid arguments against procedurals, just not the ones you have been arguing. The real argument is that they don't translate to other software packages or render engines well. The more sophisticated the procedural, the less that will translate often. So, the decision to use procedurals vs not is actually a more complex one, just not one centered on quality if one understands the possibilities and how to work with them. I will point out something else.. Just take a look at how often the Fibonacci sequence shows up in nature. Nature is built on somewhat randomized repeating patterns with noise mixed in. Joe, I have literally thousands of photos and scans that I have done myself. Not just from around home but from several different countries in different parts of the world. And yes they were all done with texturing in mind. I also have access to another several hundred photos for textures that Simon took while he was still alive. And I have scans.. So it is pretty clear I'm not to lazy to take photos and since I have been doing it for the last 5 years I have a fair bit of experience with it. I still think that you get better for purpose textures when you combine photos and procedurals to get an ideal texture that is created for the exact model your working on rather than plonking a photo on. Fine. If what I said doesn't apply to you, and you know what you're doing, then obviously it doesn't apply to you and there's no need to get defensive and upset, is there? I was addressing those who think that there's only one way to do things, and that is to rely on procedurals because they've never really considered the alternative. And why would someone believe that? Well, because in the years I've visited this forum I've pretty much NEVER heard anyone discuss the alternatives. It's always about drag 'n drop software solutions. And nobody ever discusses using reference photos or photos as textues, nor techniques associated with them. Ever. Except maybe in passing. Or to give excuses why they don't use them. And I've also seen many, many renders with textures that were procedurally driven and look, well, silly. But people don't realize how silly they look because they've never really studied textures in real life, and are relying upon their misty, and somewhat misguided, memories. Joe, personally I think it is good you took a position and defended it. In my last post I was agreeing with what you said in this last post. There are different methods that are appropriate for different situations. The best result is when people are aware of all of the alternatives and pick one that best suits their situation. The reason they don't is because next to no one uses just a photo with no additional work done to it. Look at the skin textures done with photos. Those take hours and hours of patching them together to get a good skin. To get a good texture your going to end up working on the photo in some sort of program to get it sorted. Some people do that in photo shop or psp and just do finishing. Some people run it through a program like genetica to get it to tile, get rid of flaws, add additional layers and so on. I regularly "stack" multiple photos as tiling layers that get worked over to get a better surface than any single photo resource would give me.